I see that No 29 has been left out here so thought I would add a small vignette about this wonderful locomotive that deserved better than being dissected for all to see at York. Picture a sunny morning at Winchester. 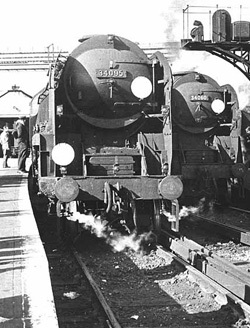 We were waiting for the 9.34 arrival into Waterloo and the platform was crowded with commuters, most no doubt oblivious as to whether their train was hauled by steam, diesel, electric, atomic or powered by a Saturn 5. From the south the morning non stop to the capital arrived behnd a very smart 35029 Ellerman LInes with Driver Skinner at the controls. Soon we were away and Skilful lived up to his name taking us up to Roundwood in fine form with much exhaust noise, topping the summit at 69 mph. We sped towards London until a dead stand at Weybridge....and there we sat. A major juice failure had immobilised everything and there was not going to be a 9.34 arrival on time that morning. Imagine our surprise after about 15 minutes if the front carriage door did not open and in climbed Driver Skinner. "Morning, I am not sitting up there when I could relax with you lot in a comfy carriage......" and so we had a good long chat before getting underway for London after a 40 minute wait. A little memory of 35029. 35029 on a down Exeter train at Woking. It would also help if I could spell Ellerman Lines!!! Not sure how I change that in the title!!! Title changed. To do this you go to the first post and click on edit. A shame that this locomotive was sectioned. Thanks for help in changing the heading. If I cannot spell Ellerman Lines , what hope will I have with Peninsular and Oriental Steam Navigation Company...............better I stick with Royal Mail or Blue Star! I have just seen a post that someone has posted over on Facebook with regards to the reason why 35029 was chosen to be sectioned by the NRM. Apparently, it was because the boiler was condemned so when the boiler was cut it would of only of been scrapped. Does anyone have any more information on this please?